Eternity Rings were traditionally given as presents on anniversaries, but nowadays they are given at many special occasions, as the arrival of a child, and are used as wedding rings too. 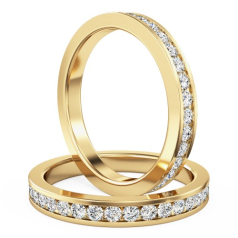 Full Eternity Rings are perfect to symbolize never-ending love, as diamonds, which last forever, form a complete circle, which represents unity and infinity. Although these old and new traditions exist, it is completely up to the couple to decide on a meaning for their full Eternity Ring. 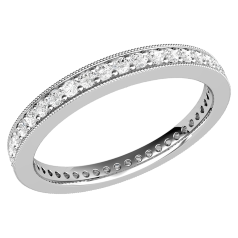 Some young couples choose a full Eternity Ring to act as a Promise Ring, a ring before engagement, to signify commitment. We offer our Full Eternity Rings in a selection of precious metals, like white gold, yellow gold, platinum, and palladium. On our website you can choose from Full Eternity Rings with different shapes of diamonds, like round Brilliant, Princess, Baguette, or Emerald, held in place by different styles of settings, e.g. Channel, Bar, Claw, and Rub-Over setting. Before purchasing a full Eternity ring, please make sure you know the recipient’s ring size, because full Eternity rings cannot be resized.